A lot of people nowadays are buying light bulbs left and right, without knowing what type their purchasing. As long as a light bulb fits into the socket, then it’s fine. 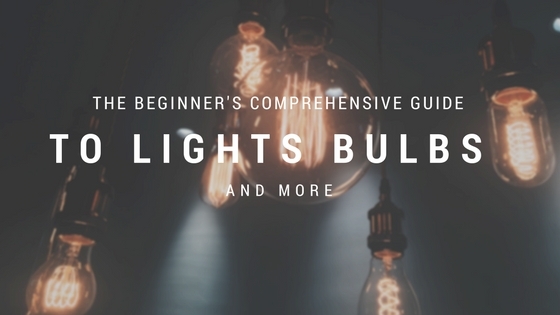 Although it’s somewhat okay for some, a little information about the different types of light bulbs wouldn’t hurt. Problems occur when people don’t know what light bulb they’re getting and can get a bit confusing for some. This confusion would lead to dissatisfaction, overloading, excessive flickering, and eventually shortening the life of some light bulbs. Light Fixture: also known as a luminaire, is a device that creates artificial light from the light source. Light Source: is the light bulb which provides the light. Wattage: The electricity consumed by the light source. Lumens: The amount of light that comes from a light source. Efficacy: Lumens per watt spent. Footcandles: The reach or the amount of illumination that reaches a subject. Light Emitting Diodes or more famously known as LEDs are some of the most common light bulbs. These bulbs are semiconductor devices that emit light when electricity is passed through. LEDs work differently from other types of light bulbs due to heat that passes through filaments. LEDs emit light when electrons combine with the semiconductor. You may ask, how do these LEDs produce different types of colors? Technically speaking, there are two main types of LEDs in lighting systems which are Aluminum Gallium Indium Phosphide or AlInGap and Indium Gallium Nitride or InGaN. AlInGap is responsible for the red, yellow, and orange hues while InGaN creates blue, white, and green lights. Pro Tip: Most LEDs are compatible with dimmer switches. Check the labels on the packaging to be sure. These bulbs work by passing electricity through filaments which heat up and glow, thus producing light. Incandescent light bulbs are the bulbs we see and think of when a cartoon character gets an idea. There are four types of incandescent bulbs available. These bulbs are inexpensive and readily available. These lights produce a warm white to yellow light that goes into all directions. They also have three shapes available: General, Globe, and Decorative. These bulbs have reflective coatings inside that direct light into one direction, instead of spreading it everywhere. These light bulbs double the number of foot candles than those general service bulbs that have the same wattage. Commonly known as halogen bulbs, produce a brighter light than all the other incandescent bulbs. These bulbs also have longer life spans which are excellent choices in consumer’s eyes because of their efficiency. These lights last longer of the three previously mentioned, up to more than 15,000 hours. These small bulbs work best when put inside cabinets and other cove lighting applications. Pro Tip: Almost all incandescent light bulbs are compatible with dimmer switches. Compact Fluorescent Lights or CFLs are bulbs which utilize mercury and other gases which produce bright light by charging them with an electrical current. These are also efficient because they last longer than incandescents. With the light that they produce, CFLs emit warm light mimicking incandescents. There are also fluorescents that have a wide variety of colors available. T8 Bulbs, are also classified under fluorescents and is the choice of light sources when it comes to large ceiling fixtures. Most lights hum when used in larger installations. Due to their electronic ballasts, T8 bulbs do not hum. Pro Tip: Compact Fluorescent Light bulbs contain mercury and are very dangerous when you do not dispose of it properly. Most CFLs are also incompatible with most dimmer switches. Make sure to check their labels if they are compatible with dimmers. Buying light bulbs aren’t so simple especially when you don’t know what type it is and what is its purpose. There are also terms that some people don’t understand such as Light fixtures, Sources, and Wattage. Light bulbs also come in different types such as Incandescents, Fluorescents, and LEDs. With a little reading, one can fully understand these not-so-complicated terms and their specifications.